Chiang Mai is a city rich in history with a distinct beauty and heritage of its own. Blending Burmese, Laotian and Indian culture, the Lanna culture is unique. In addition to special dishes found only in the North,the people of Chiang Mai have their own dialect, their own customs and their own Lanna architecture, immediately recognizable on the ancient temples that can be seen everywhere in the city. Pouring lustral water during Intakin Festival - used to ask for peace and rain to fall during the right seasons. Elephant caravans were the main form of transport between Chiang Mai and the rest of Thailand till early in the 20th century. A Distinct Cultural Heritage Prior to the the completion of the Bangkok-Chiang Mai rail link in 1922, the journey by river-boat would have taken three to six weeks depending on the time of year. In 1867, a missionary, Dr McGilvary, was three months on the journey. In 1913, when the railway went as far as Den Chai, about 200 kilometres southeast of Chiang Mai, Reginald le May, a British resident, recorded that the journey took 11 days - the mountain section on foot. Isolation allowed preservation of well-defined cultural traditions and values. The Thais in the North still refer to themselves as "Lanna" people. Their dialect is somewhat different to central Thai, such that a Bangkok native arriving for the first time might barely understand half of what's said - till the local uses the Bangkok, or national dialect. Their dress differs somewhat, as do customs, festivals, and art forms. Notably, the cuisine shows few similarities to that of central Thailand at all. Only their traditional system of writing has been given up in favour of the national script. Chiang Mai may no longer be the sleepy backwater it once was, yet its pace of life is much slower than that of Bangkok. If a visit doesn't take you back in time, it certainly reminds you of a more leisurely, bygone era. In the cityscape modern buildings haven't obliterated ancient architeture; in working life few craftsmen have exchanged old skills for the techniques of modern production. The prevailing mood of the place is one of continuity; today is secure in the knowledge of the past and is little concerned about what tomorrow may bring. A sense of security rooted in an identity defined over centuries is apparent in the people. Those of Chiang Mai are far more easy-going than their Bangkok counterparts. They remain faithful to long-held values; home-loving, thrifty and wary of spending money ostentatiously. At the same time, that quintessential Thai trait of sanuk, having a good time, has not been diluted by the modern business ethic. 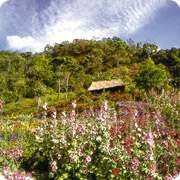 With an abundance of mountains, forests, valleys, waterfalls, caves, lakes and National parks in the area, Chiang Mai abounds in natural attractions that are popular tourist destinations. A view of Doi Pui countryside - near Doi Suthep. At the foot of Doi Inthanon National Park: the lovely Mae Klang Falls, Chiang Mai's most photographed waterfall. If you are looking for a little excitment, consider an elephant ride, available at different elephant camps. As an alternative to the popular camps, you can also take part in elephant safaris and white water rafting through jungle area and mountain scenery at Mae Wang - or embark on inflatable rubber boats for a voyage down the Mae Taeng river. Wat Prathat Doi Suthep, perched high on the flank of Suthep Mountain, 1,022 m (3,000ft) above sea level, is Chiang Mai's most famous temple. The pagoda in its centre contains some of the relics of the Lord Buddha. The temple is visited thoughout the year by thousands of tourists and Buddhist pilgrims from all over the world. Visit Lanna Style temples, see the Old City Gates around the moat and visit authentic Chiang Mai markets by Samlor. Similar to the tricycle, but much larger, these pedaled treshaws are Chiang Mai's oldest form of transportation. Taking a ride in a Samlor is an excellent way to take in the city sights. Transfers from airport to hotel are FREE of charge in Chiang Mai and Chiang Rai. (One-way). Up to 4 persons and 4 luggages per room. From Dusit Group; Luxury hotel with caring service in the best 'Lanna' tradition. Located in the center of the Night Bazaar. Newly opened 4 star hotel at Tapae Gate. The first Deluxe 5-Star hotel in Chiang Mai. Located on the banks of the Mae Ping River. Doi Inthanon National Park is a 1,005 square kilometre area which includes Thailand's highest mountain and areas of dense virgin rain forest. At the foot of the mountain you find the lovely Mae Klang Falls, Chiang Mai's most photographed waterfall. The largest and most popular of the local handicraft factories are situated along a 13 km stretch of the Chiang Mai - Sankampaeng Road. Both sides of the road are lined with factories and showrooms where you have the opportunity to observe the craftsmen and women at work and purchase their fine products. As an alternative to the popular elephant camps along Mea Sa Valley and Chiang Dao road, you can also take part in elephant treks through the jungle or white water rafting off the beaten tracks in Mae Wang area. Enjoy a 10 kms gentle mountain bike ride to a traditional Thai village and continue with a 1.30 hour elephant safari through beautiful mountain scenery. After your traditional picnic at the elephant camp, embark on an inflatable raft for a 1.30 hour voyage down the white water of the Mae Taeng river. Then walk up a steep mountain trail (1.30 hour) through dense jungle to an Akha hilltribe village. Have tea with an Akha family and ride your bike back to the resort.